Windstar Lines is proud to provide the highest-quality charter buses in Fort Dodge, IA and the surrounding areas. Since 1995, our family owned and operated bus rental company has been helping Fort Dodge residents plan trips. We provide updated, luxurious transportation with customer service taken to a whole new level. If you are in need of expert drivers and a travel company that can help you plan your next trip, look no further than Windstar Lines. With industry-leading drivers behind the wheel, you're free to sit back, relax and leave the driving to us. Passenger safety and customer service are of utmost importance to us. We want you to know that you are safe and that you will arrive to your destination on time in comfortable luxury. Fort Dodge is the county seat of Webster County in Iowa and is along the Des Moines River. Fort Dodge is considered a major commercial center in North Central and Northwest Iowa. It is located on US Route 20 and 169. Fort Dodge's beginning can be traced back to 1850 when soldiers from the United States Army erected a fort at the junction of the Des Moines River and Lizard Creek. It was originally named Fort Clarke but was renamed to Fort Dodge because there was another fort by that name in Texas. It was named after Terry Dodge, a governer of Wisconsin Territory - which included Iowa at the time. The fort was abandoned in 1853. The Fort Museum and Frontier Village is located on the southwest edge of Fort Dodge and is a full-scale recreation of the military outpost on the prairie from the 19th century. Fort Dodge is also home to the Blanden Memorial Museum. Fort Dodge has a local music and art scene as well as numerous parks and recreation. Fort Dodge is also home to Iowa Central Community College. Learn more about Fort Dodge on their Official Website. 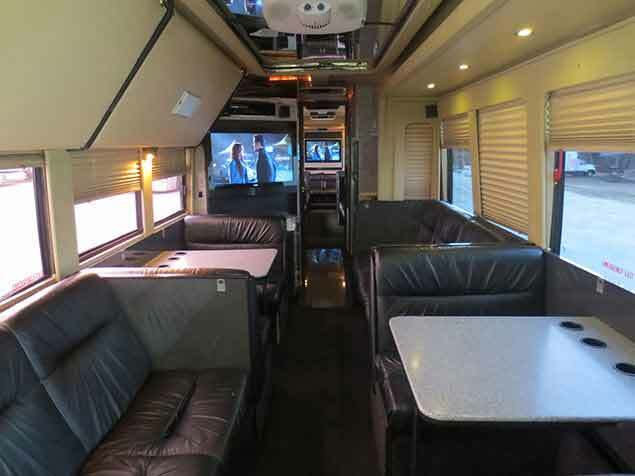 If you are ready to plan a trip, whether it's for business or pleasure, contact us today for a free quote, and we can get you on the road with one of our motorcoach or bus rentals in Fort Dodge, IA. Our drivers are the best trained in the area and they must be licensed and certified to meet all state and federal laws. But more importantly, our drivers care about the safety of our customers. We want to make your trip memorable, safe and comfortable. No matter what size group you have we can assist you and we have the best options at the most reasonable bus rental prices for your next trip.